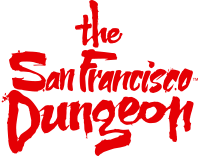 The San Francisco Dungeon welcomes guests with disabilities, together with their helpers and care givers. This page aims to provide information to help guests with disabilities make the most of their visit with us with details of accessibility and visiting information. The majority of our facilities are designed to be fully accessible to ADA guests. However due to the complex nature of an emergency evacuation, it is not possible for a wheelchair user, or those with difficulty walking to participate in Shanghai Kelly's Show unless able to self-transfer on and off the conveyance.